A new program will enable students to earn a master's in science education and their initial certification to teach science—in one year. "This is a very progressive program," said Catherine Lange, assistant professor of earth sciences and science education. "It’s also a very attractive program because it’s so streamlined." Lange, who worked with Joseph Zawicki, associate professor of earth sciences and science education, along with other department faculty and staff, to draft the 175-page program proposal, explained that they arranging the coursework, student teaching, and a master’s project into a summer-fall-spring program that can be tailored for individual students. "We are offering the same courses required of all initial-certification teachers’ programs," said Zawicki, "but we have developed the program so that students are immersed in a graduate-studies model that includes education, theory, practice, and research." The 37-credit-hour program includes 21 credit hours of coursework, a 3-credit-hour master’s project, and 13 credit hours of student teaching (encompassing a seminar and both middle-school and high-school student teaching placements). 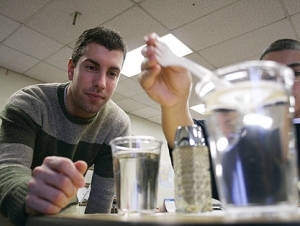 "Science education is moving away from teaching discrete units by rote," said Lange. "Instead, we’re teaching concepts, and certain concepts have to be learned before others. You can’t just jump into understanding Newton’s laws." One new course is SCI 502 (Secondary Science Education Teaching: Theory, Content, and Pedagogy); another is SCI 650 (Current Topics in Science Education). The latter helps students plan their master’s project. “In 650,” said Zawicki, “students learn about the IRB process.” The IRB—Institutional Review Board—reviews research that involves human subjects, and some graduate students may design studies that include pupils in their student-teaching placements. Whatever research method students employ, the research project itself must be connected to science pedagogy. "Current topics in science education include things like revised teaching protocol and differential instruction," said Lange. Differentiated instruction is a response to the different ways students learn, and it is essential in contemporary blended classrooms that include students with different abilities. "By requiring a research project," said Zawicki, "we’re also making sure that our graduates have some experience conducting scientific research." To be accepted into the program, students must have a bachelor’s degree in biology, chemistry, physics, or earth sciences, with 30 credit hours in the area of concentration. "Buffalo State alumni have a quick-admit process," said Lange. Interested students should contact the Science Teaching Center at Buffalo State. "A lot is changing in science education," said Lange. "And we’re ahead of the those changes."